Jotron AS will end the production of the Tron 45SX battery, part number 97770 1st August 2018. 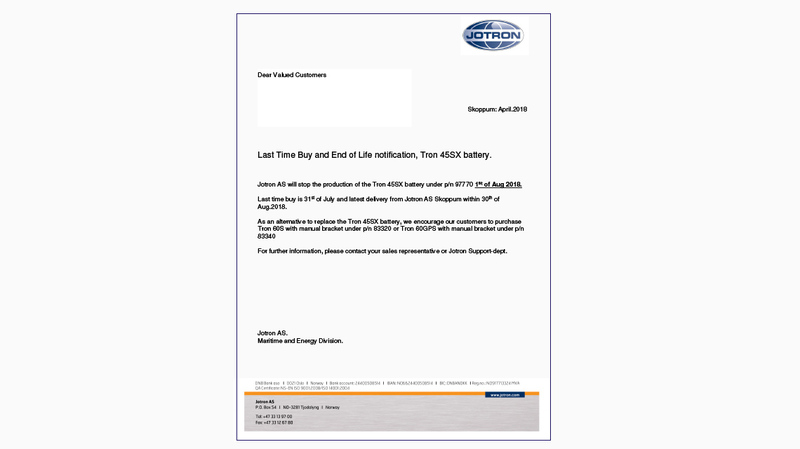 Last time buy is 31st July and latest delivery from Jotron AS Skoppum is within 30th August 2018. Jotron encourage customers to purchase Tron 60S with manual bracket, part number 83320 or Tron 60GPS with manual bracket, part number 83340 as a replacement to the Tron 45SX battery.